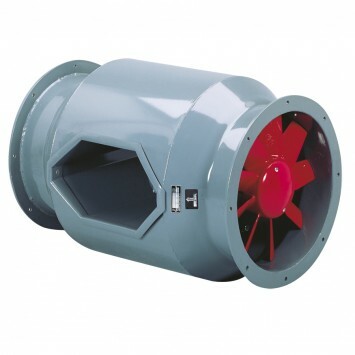 Range of bifurcated axial flow fans with motor isolated from the air stream making this range suitable for continuous operation up to 150ﾺC. The casings are manufactured from high grade rolled sheet steel protected against corrosion by grey epoxy-polyester paint finish. All models incorporate one piece die-cast aluminium impeller. The impellers are finished with red colour epoxypolyester paint coating. Available, depending upon the model, with three phase motors in 2, 4 or 6 poles.